In E-Ville, rain in November is never a good thing. For one, somebody always posts that stupid G’n’R song on Facebook and then I get it stuck in my head until the weather changes. It was sweet riding for a couple of days, though. The rain ate away the snow on the ground and with a good jacket, high boots and waterproof gloves I was quite comfortable and enjoying riding at high speed downtown. 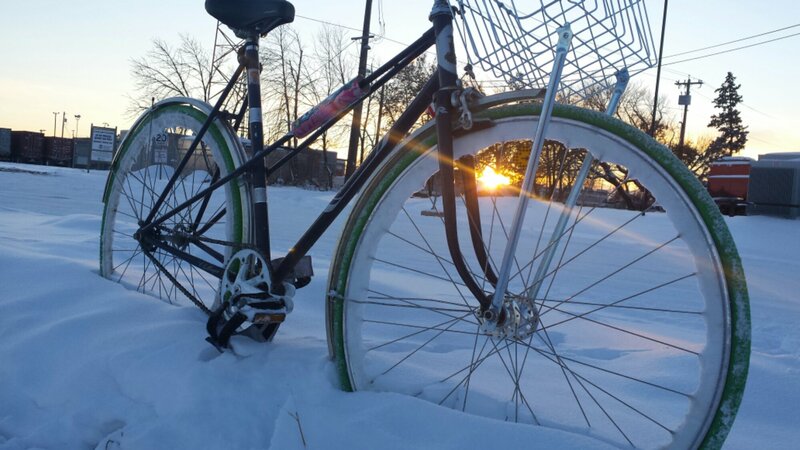 Since the first snow this season, I’ve been riding the fixte because I haven’t had time to put winter tires on my other bikes, but mostly because it’s fun. Skiddly-skiddly. Those who’ve known me for a while have pointed to the influence of a certain ridiculously speedy courier, but I’ve recently realized that the influence has gone both ways. 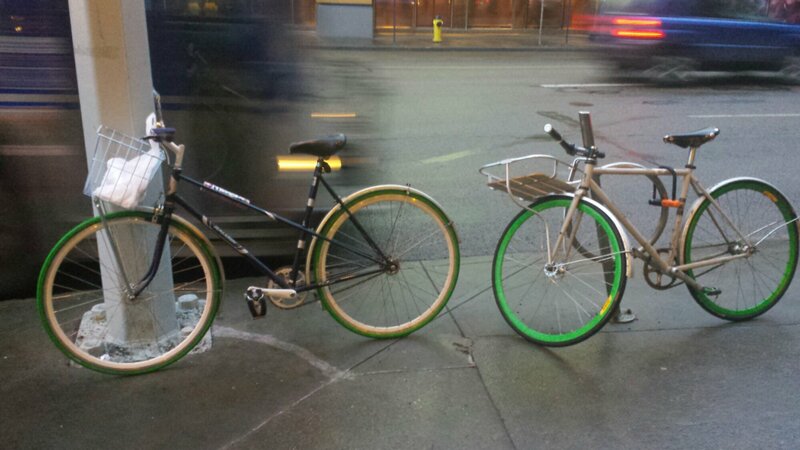 Fixies with fenders and baskets and green wheels, oh my! 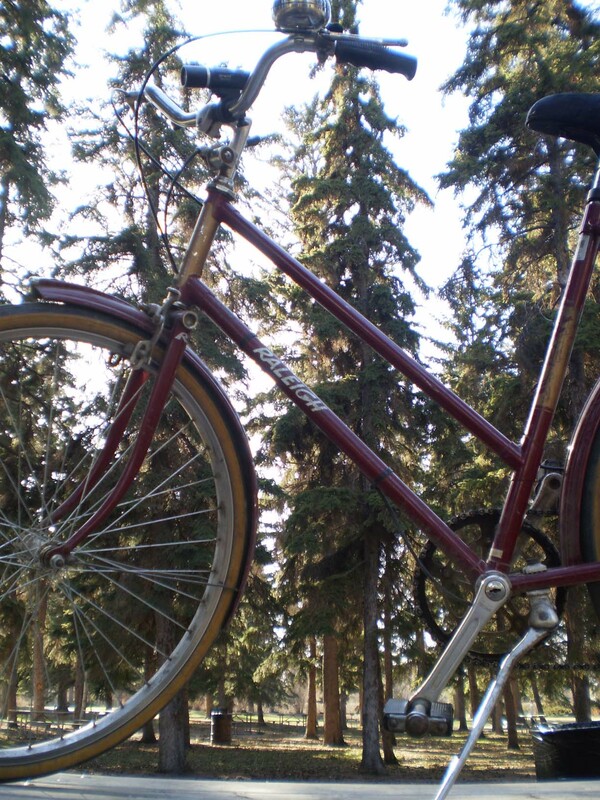 Check out the full fenders and front baskets on these bikes. Of course, November rain turns to slush and freezes, creating the dreaded bumpy ice. It didn’t take long for me to have my first wipeout, and despite momentarily forgetting I was strapped into the pedals, I didn’t suffer so much as a bruise. Eventually the rain in this late season turns to snow and we got eight inches of the wheel sucking white stuff over the weekend. There’s even enough snow for the ol’ Canadian kickstand. Looks like I can put off installing a kickstand for a while. I still need to make some more changes to the fixte. Installing that pretty white crank increased the gear ratio a little too much and put my chain line a little too off and I’ve had a larger cog and shorter bottom bracket on order for what seems like forever. 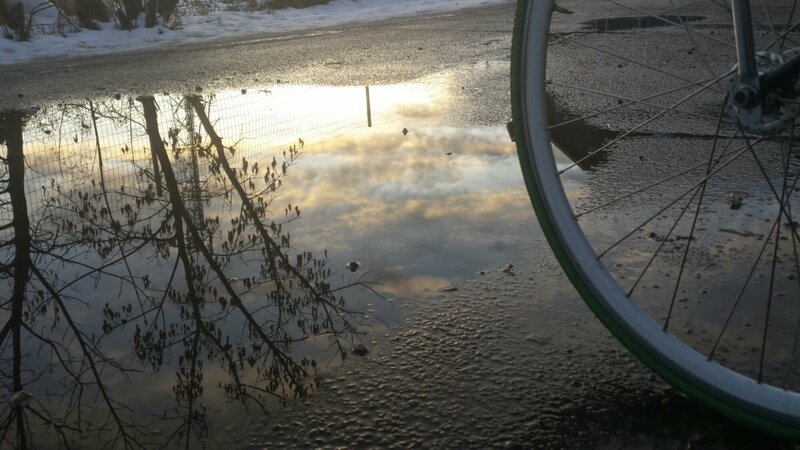 Ironically, it was only this past week before the snow flew that I was feeling like I was fully managing the gear ratio. In the mire of oatmeal snow that now encompasses most of the roadways however, I won’t be getting very far without that bigger cog. Hopefully the wait will end soon. Sometimes, I just have to be outside. 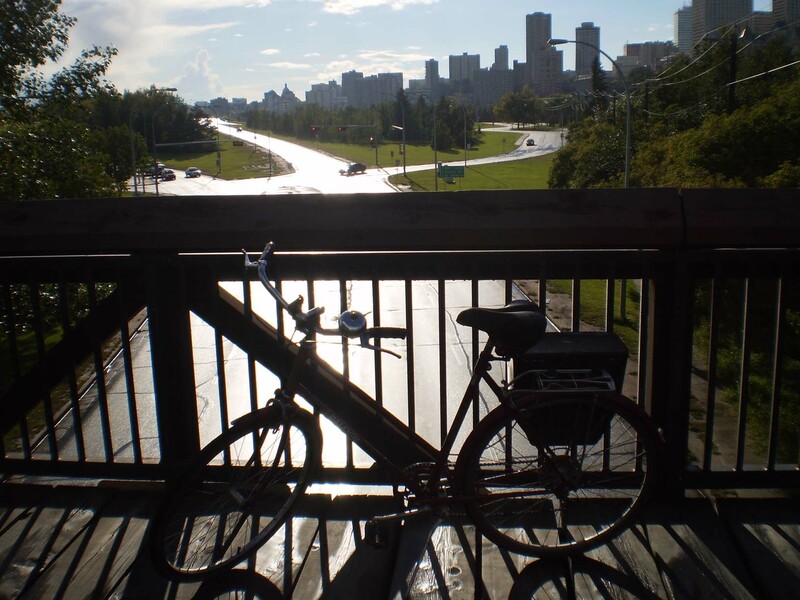 And with summer underway, I want to savour every moment, including the warm summer rain. On this evening, all I wanted was to sleep in the forest away from other humanity and let the gentle percussion of rain drops on the fly of my hammock lull me to sleep. So with little daylight left, and a brief break in the rain, I headed out to a little place I know that’s off the map but not too far from home. In the home of the deer & coyotes. 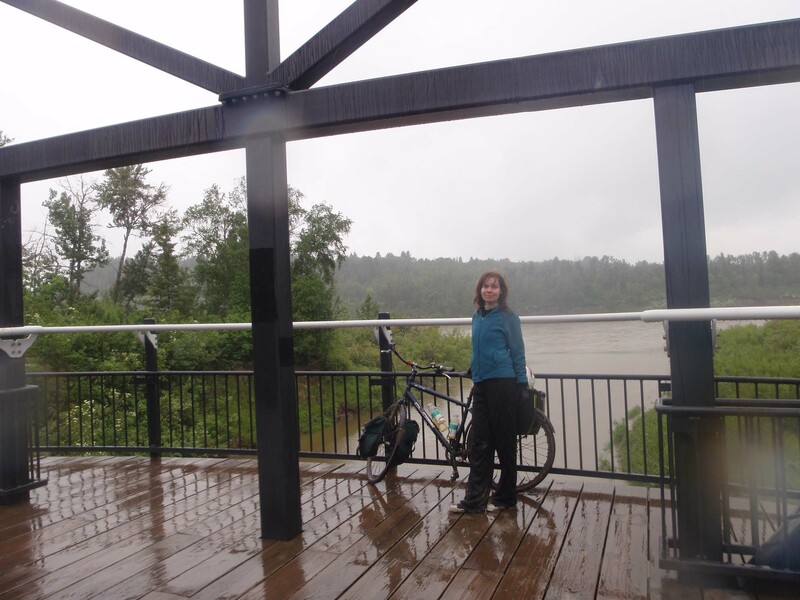 Part of the reason I wanted to go was that I wanted to test out my gear in the rain before heading out on a longer trip, and I knew that the destination I selected would allow me to head home without too much trouble if anything failed. 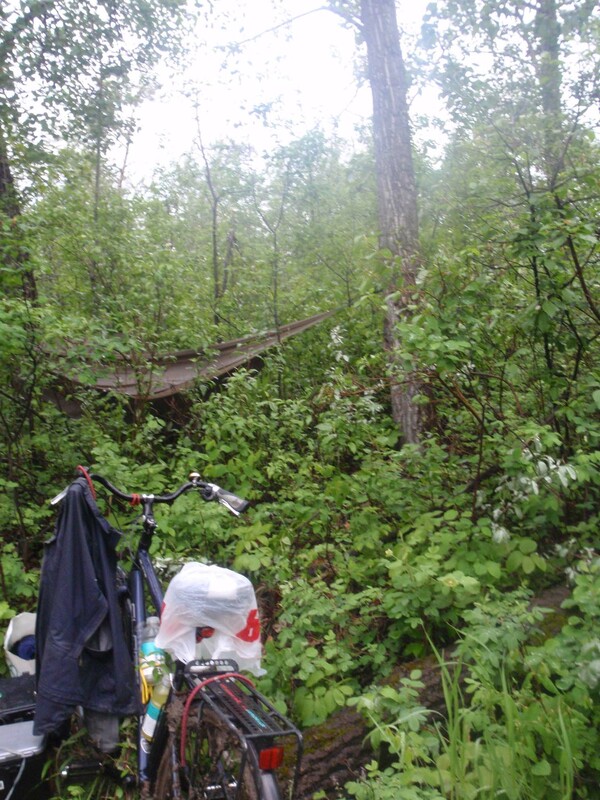 My wet camp in the misty woods. Getting there wasn’t as simple as I thought. There once was a gravel road leading into the area, but all the gravel has been removed and only the clay road base remains. I suppose this was to aid in the “naturalization” process and keep domesticated animals (specifically humans & dogs) from bothering the local wildlife, and it wouldn’t have been a problem if it hadn’t already turned into a soupy, slippery mess from the day’s rains. 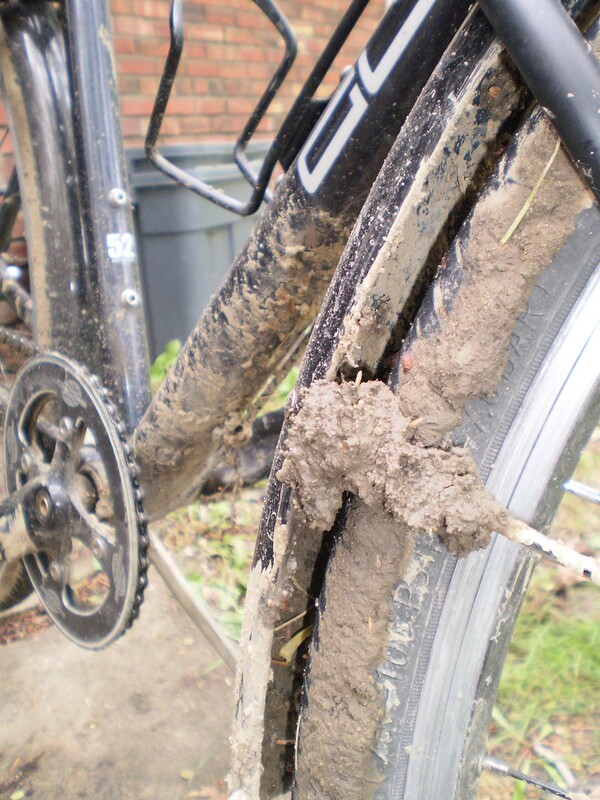 As I powered through the mud on my fully loaded bike, the clay just stuck to it, enveloping my brakes, clogging my fenders, plastering the backsides of my panniers. 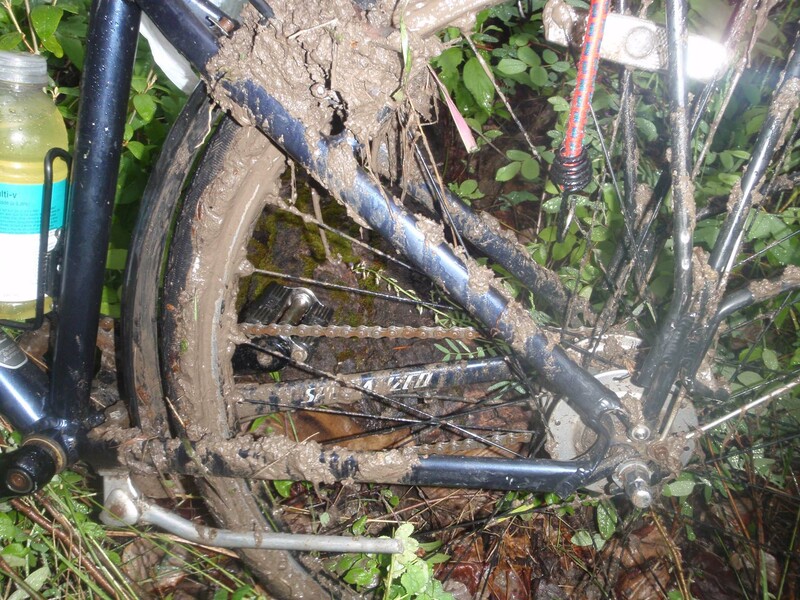 This is what my bike looked like after riding through a quarter section of hay fields and another section of game trails in the bush, which was my strategy for trying to knock the muck off. 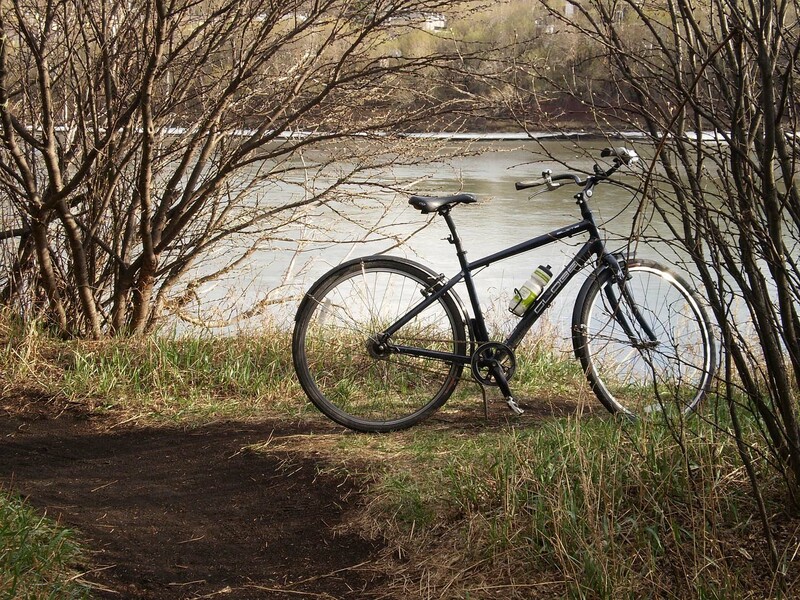 I ended up having to drag my bike through some of the mud, and had to grab sticks to poke out the mud & rocks that were preventing my wheels from moving. After finally passing the horrible used-to-be-road, it started to rain again, and I realized that I’d passed the point of no return. I managed to set up camp and retreat to my hammock with, literally, seconds to spare before the sky completely opened up. Dry and cozy, I curled up and listened to the rain and thunder and the runoff rushing underneath while gently swaying with the trees. And between showers, I could hear the coyotes howling and slinking through the forest. While my stay was refreshing, it wasn’t exactly restful, and I was up (for me) freakishly early. Eager for a hot drink and to try out my new toy, I broke out the Trangia to make some tea. 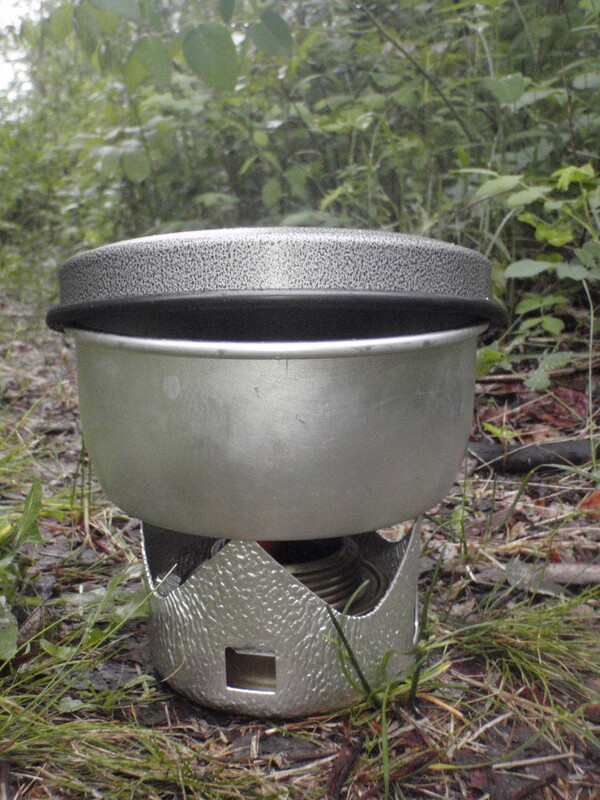 A Trangia is a super lightweight alcohol fueled camp stove. It took a few minutes to boil 2 cups of water. The rain stopped just long enough for me to have some breakfast & break camp, and I was re-energized by the hot drink & fuel. After trying to poke what mud I could out of my wheels, I started the return journey. Unfortunately, the only way in or out of this place with a loaded bike is the non-road that I took on the way in. Because it had been raining all night, it was even more of a mess. I would ride until my wheels wouldn’t turn (about 10-50 feet) and then poke out as much clay as I could with a stick and try again. 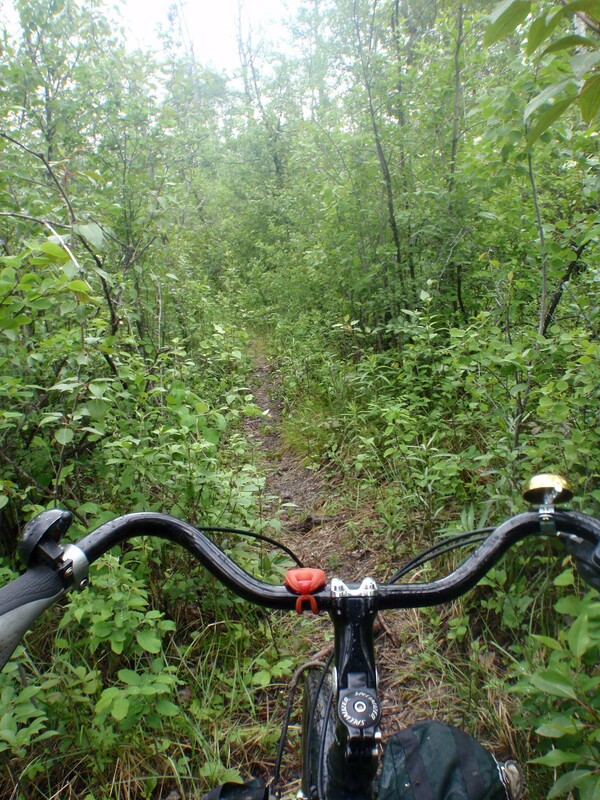 I’d get off the bike and drag it, all the time barely keeping my own footing in the greasy mud. By the time I made it through that half mile of hell, I was exhausted and felt like I didn’t save any energy by not going much further afield. My upper body was sore for days after, but the worst casualty of the day was my bike. 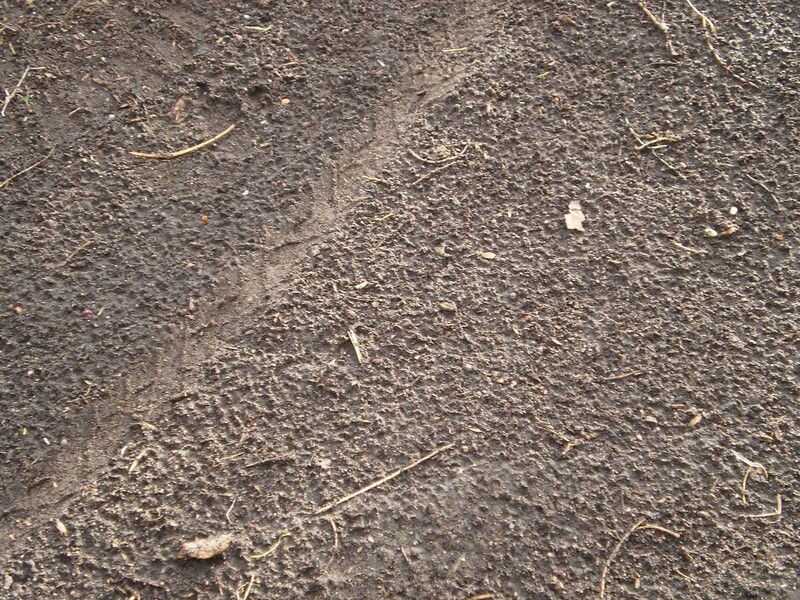 A couple of days later, when I took the Globe to EBC to chisel off the caked on mud remains, it took me 5 hours to clean it, and when I swept up the pile of dried mud under the bike stand it weighed more than 3 pounds. Come to think about it, I still haven’t cleaned the mud off of the backs of my front panniers – better get on that before the next trip. When volatile prairie skies bring sudden downpours, knowing a place to take shelter can make surprise rain more bearable. 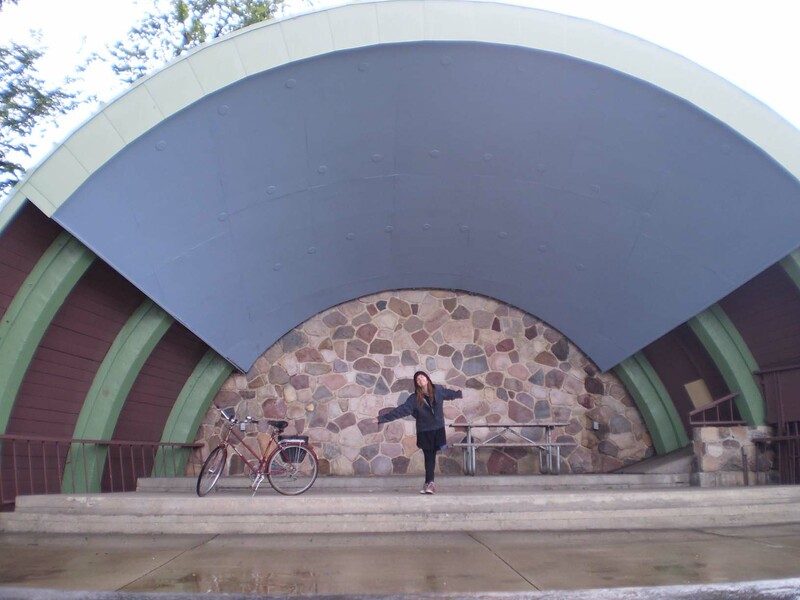 One of my favorite spots is the band shell in Borden Park. Did you know that at one point, the roof of this band shell was filled with pine cones by some very industrious squirrels? The local saying, “if you don’t like the weather, wait 15 minutes,” was pretty spot on today. 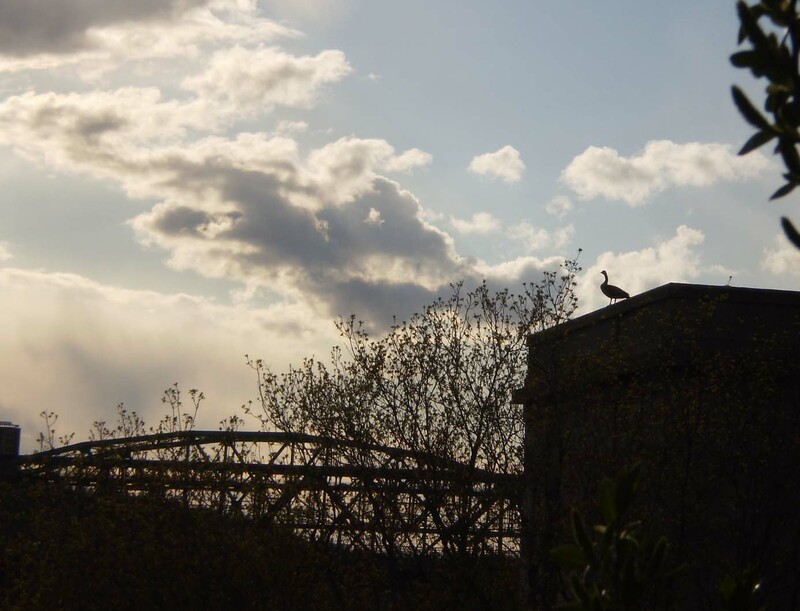 The sun returned before I even left the band shell, glaring and reflecting off the wet streets, blinding anyone who had the misfortune of heading west. Look at the road and risk going blind. 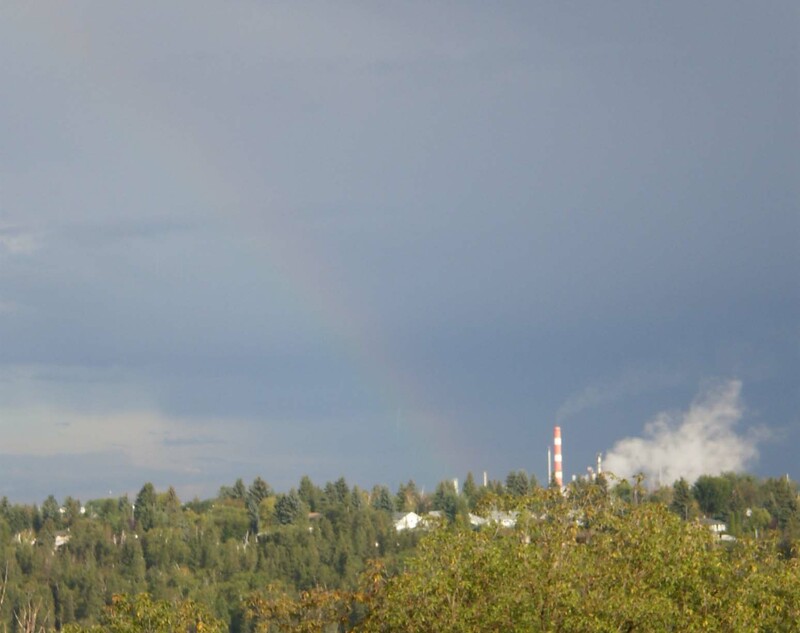 Sunbeams dried out my clothes as a rainbow formed over refinery row. This about sums up my complicated feelings toward E-town. And suddenly a cool, fall-ish day was unbearably hot, and the shelter I needed was from the sun (at least for the next 15 minutes). Categories : View from the bike lane. 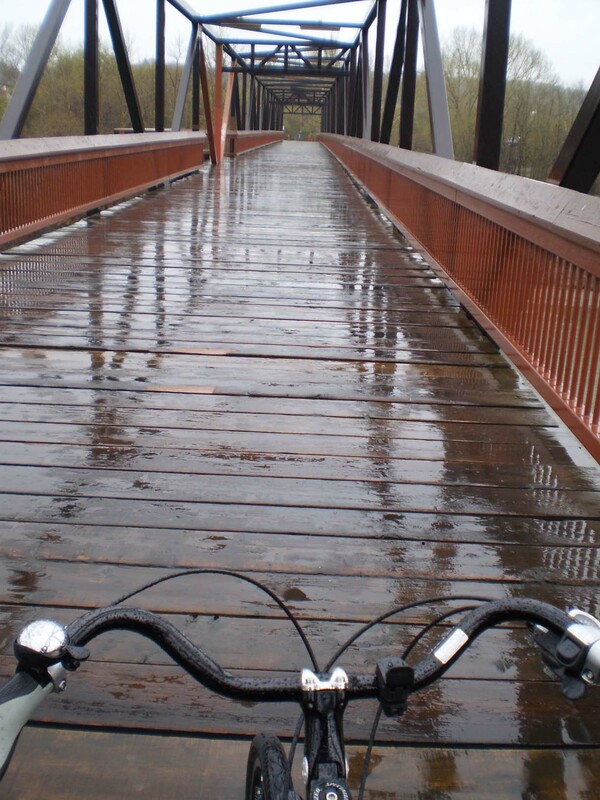 A little rain won’t stop the riding, just like several days straight of rain won’t stop the riding. Add fleece-lined tights, a hood, gloves and gore-tex (not pictured) and it’s not so bad (at least until losing feeling in the fingers after stopping to take pictures). Ducking out of the rain but not wind for a quick documentation of foul weather fashion. 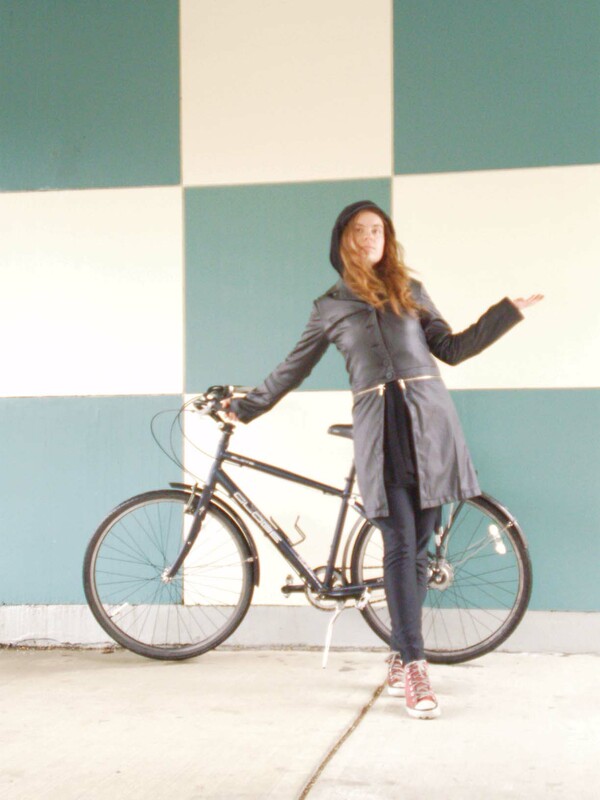 The chilly rain refreshes and soothes the skin better than anything from a cosmetics counter, and the ride makes the whole body glow from within. Then a friend calls up and asks for help making a film of people riding in unusual places, so why not? Another one for the "it seemed like a good idea at the time" file. The video better be epic. Aaahh, E-town’s characteristic light coloured mud-clay, still clinging after a long ride through tall wet grass in an attempt to get it off. So not looking forward to cleaning this up. A blue sky, a strong, warm wind, skin that hasn't seen the sun since 2009, bright stripey socks, red stubby riding gloves, bike shorts, a swift steed and a million dollar view. What else could a girl want? Pausing at a bend in the path. Sunshine after an April shower. Marjory in the pines (though I think they're actually spruce, but pines sounds better). And at long last, a thoroughly soaking rain.